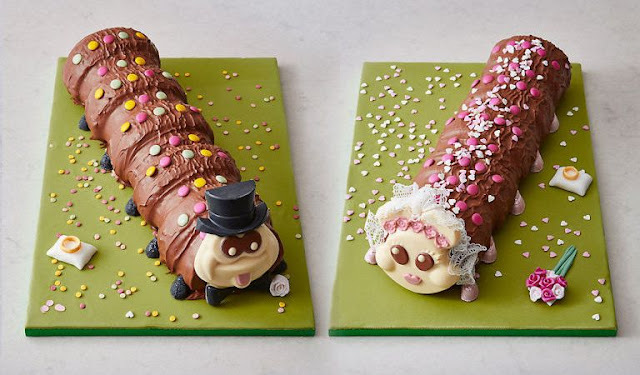 Yes, you've read that right, Colin the Caterpillar is getting married! Our favourite birthday cake and go-to for all types of celebrations has been made into the wedding cake of all wedding cakes. Thanks to the geniuses over at Marks and Spencer, not only can you purchase Colin getting married - suited and booted with a top hat, bow tie and shoes - but you can also purchase his female friend, Connie, with veil, bouquet and all. Available to pre-order now and available from the 23rd February, this will take your wedding to the next level - if you're willing to pay the price, that is. For £50 a piece you can buy just one cake, either Colin or Connie, but if you want both, then it's going to cost you a hefty £100. We say hefty because if you were to buy the bigger version of the normal Colin cake, that would cost £35. For a little bit more decoration, we're not quite sure if we would pay that much extra when you probably could just do it yourself. Regardless of the price, we love this! The only question is why has it taken so long for M&S to do this? !